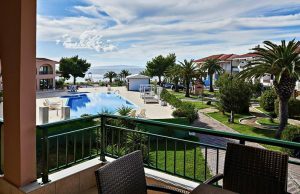 Blue Sea Hotel in Toroni is a luxury 3 star Hotel located 129 km from Thessaloniki airport. It is located on the peninsula of Sithonia. It is an attractive destination for thousands of visitors, both Greek and abroad.While spending holidays there, the tourists have the opportunity to visit Toroni. Halkidiki Toroni is 129 from Thessaloniki airport. So it takes an hour and a half to get there. It is a rather well known coastal destination. Its location is in the northwestern section of the peninsula of Sithonia. The golden sandy beaches and the clear sea, therefore, will make you have an ideal, unforgettable holiday. Elia beach extends for almost two kilometres. The pine forest reaches many parts with low cliffs, allowing the pines to overhang the narrow strip of sand, offering most of all shade, but also a unique feeling. Select both date and time of Departure. Select Pick up location “Thessaloniki Airport”. Choose Toroni for Drop off location. Insert the Number of passengers (including Children). Write on the “billing details” form at the “Additional Informations” at your location address the Name of the Hotel “Blue Sea Hotel“ . 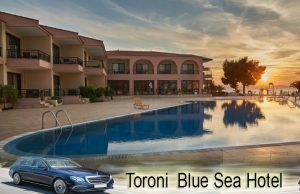 Thessaloniki taxi transfers undertakes your transfer from Thessaloniki airport to Toroni Blue Sea Hotel in Halkidiki, with comfort, safety and reliability above all. First, our luxury Mercedes E class cars are always clean as long as in an excellent condition. Meanwhile our polite, helpful drivers are willing to undercover what a passenger needs . In conclusion, our experience, the high quality of our services and the low cost charge, offer a rather comfortable and safe journey.